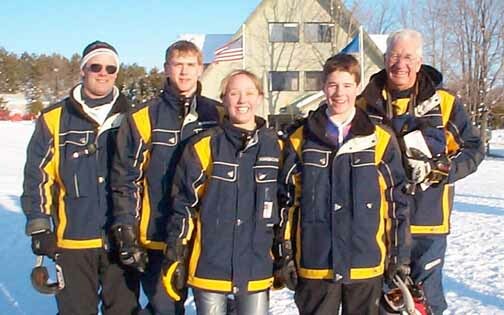 The weather was perfect for the 1st Annual Benzie Invitational held at Crystal Mt., 1-30-03. The Benzie ski boosters put on a very nice race and did it with superb efficiency. The entire race was run in 2 hours. With medals for the top 6 placings only, the kids worked hard to maintain medal status. Does Coach Miller finally have the boys team running on all cylinders? He's getting close, real close! Coach Miller is not going to let up on them. He is not afraid to repeat himself and will continue to tweak the teams until the very end of the season. Left to Right, Assistant Coach Curt Mathieu, Christopher Smith, Kaylie Mathieu, Wiley Heller, and Coach Dale Miller. Manistee's Connor Pelton won the boys giant slalom with runs of 18:66 and 18:84. The portager boys placed 2nd in slalom with 36 points. Chris Smith paced the portager boys with 20:49 and 20:63 for a combined effort of 41:12 giving him the 6th place medal. Wiley Heller came in right behind Chris placing 7th, with his times of 20:40 and 20:75 for a combined time of 41:15. Jackson Carter slid into 11th place with 20:86 and 21:03 and Travis Berklund placed 12th with 21:31 and 21:09. Alex Harris came in with 21:68 and 22:12 for 17th place and Garry Honeycutt finished 24th with his times of 24:64 and 23:93. The boys went on to finish 3rd in slalom with 42 points placing them 2nd overall for todays invitational. Mt.Pleasant's Joe Torreano won the slalom race with his times of 24:35 and 24:64. Wiley Heller proved to be the fastest portager in boy's slalom today grabbing the 4th place medal with his times of 24;80 and 25:14. Jackson Carter placed 9th with 26:66 and 27:02. Chris Smith finished 14th with a first run of 25:78 and a small bit of trouble at the bottom of the course gave him a second run of 32:19. Alex Harris placed 15th with his times of 28:91 and 29:09 and Travis Berklund 17th with 28:64 and 29:68. Garry Honeycutt placed 23rd with 33:60 and 34:44. In the combined competition Wiley Heller received the 4th place medal for his 4th and 7th places. Jackson Carter finished 7th, Chris Smith 9th, Travis Berklund 13th, Alex Harris 15th and Garry Honeycutt 26th. 2/13/03 Regionals @ Crystal Mtn. The Portager girls placed 4th in slalom with 53 points. Mt. Pleasants Katherine Martin won the slalom contest with a combined effort of 51:09. Stephanie Griffin placed 7th for the portagers with her times of 27:27 and 28:00 and Kaylie Mathieu 12th with her times of 27:88 and 28:74. Kelli Hopwood finished 14th with 29:56 and 29:77 and Charlette Kalbach 20th with 31:60 and 31:63. Dani Olson placed 21st with a first run of 30:95 and a second run 32:49 and Erica Jach finished 27th with her first run of 29:38 and a second run of 40:95. 47:99. Dani Olson finished 24th with her combined time of 51:06. Stephanie Griffin placed 7th, Kaylie Mathieu 9th, Kelli Hopwood12th, Charlette Kalbach 17th, Erica Jach 21st, Dani Olson 23rd. 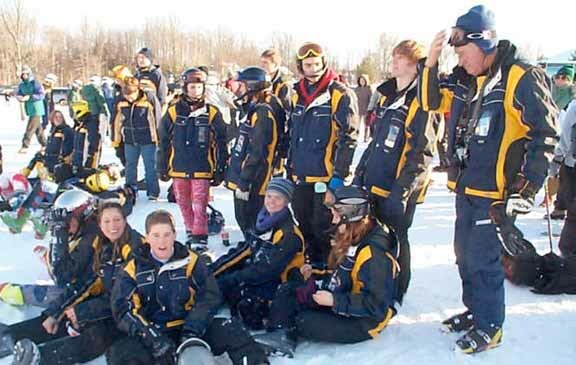 The next race for the Portagers will be the Manistee Invitational held Monday Feb. 3rd at Crystal Mountain. Manager Jared Lutz , hands Alex Harris his coat after Alex finished his slalom run. Like Monica, Jared must race down Loki ahead of the racer so they are there with the racers' coat as the racer finishes the course on Thor. If skiing without poles teaches you proper balance and centering on your skis, then manager duties surely get you ready for your career in highschool racing! The team gathers in a group with all the other teams to await the start of the awards ceremony.